Perhaps you did not get to see others done before you but sometimes there is merit in being the leading pioneer. There will be photos of the works of others for you to see - of the Blue Moon items. Though mine will look rather a lot different than yours in my anticipation. But, as you pointed out, once I get brush to resin, perhaps I'll change my mind. Hope the various collections of the Boxer Rebellion others have posted were at least of some help to you - though mostly those were scratch built items by necessity. Before the Blue Moon Extravaganza release, there were no alternate options in 15 mm worth speaking of. The British legation looks great. Lovely stuff, and looking forward to the "complete collection" photographs. Couple of points. I seem to remember that the British Legation was also important, quite apart from the factors you mention, because it had a source of water within the walls. I can't specifically remember, but I presume that this must have been some kind of well. More importantly, the British Legation also had a "Bell Tower" - a kind of Chinese Pagoda with a large bronze bell within - which functioned as a vital "notice board" during the Seige, not only for the British but for all of the defenders. And then there was a cemetery within the walls, too, for the poor unfortunates killed during the siege, including at least one of the "Student Interpreters". I could dig out some photos, I think, if you're not already completely familiar with all of the above! FifteensAway, I always appreciate your generous comments. I should also mention that your comment about the canal colors has been working on me. I have enough plastic to do two canals that are 7 ft in length. I will paint both with my Testers' Dark Blue/Bright Blue combination... my go-to combo when painting water, but one of the two I will dry brush with a mix of Vallejo Andrea Blue and Brown Violet (a dark olive drab). I used that as the color for my sewer water in my 28mm Gangster Gallery... we'll see. smirnoff, thanks so much for taking the time to send along the very kind word... doesn't get much better than superb. Much appreciated. leadboy, to be quite honest after more than six months of working on this project I'm looking forward to seeing the photographs of the complete collection in layout form myself. Let me be very open about the fact that in putting this layout together there are several controlling factors that trump history and facts. One of those is the size of my tables. For years I have used two 5 ft. by 7 ft. tables for all of my big layouts. In terms of the legation area in this collection, that means I will have to do my best to represent as closely as I can the relationships of the key locations, but that will be far from perfect. 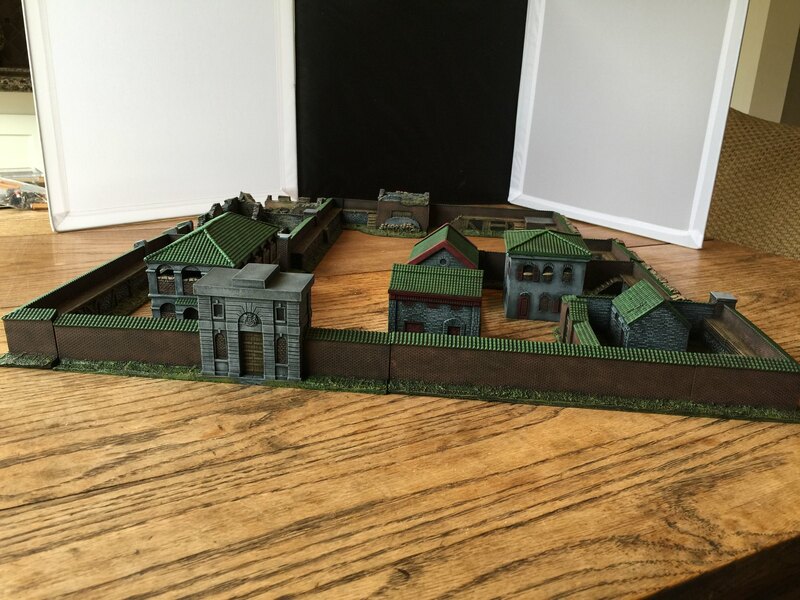 I will be using both tables, but each table will represent a different phase (pre-siege and siege) not different locations in the legation area. A second controlling factor has to do with the fact that having looked at many photos for this project, I have seen only a limited number that reflect the interiors of the different compounds and many that show the main entrances, and have read only one reference to the color of any of the legations, and that reference stated that the tile used by the British was green. Your mention of the bell sounds like something I have read or perhaps saw in the movie, but Blue Moon didn't make a structure identified as such, and I don't believe I've seen a photo. 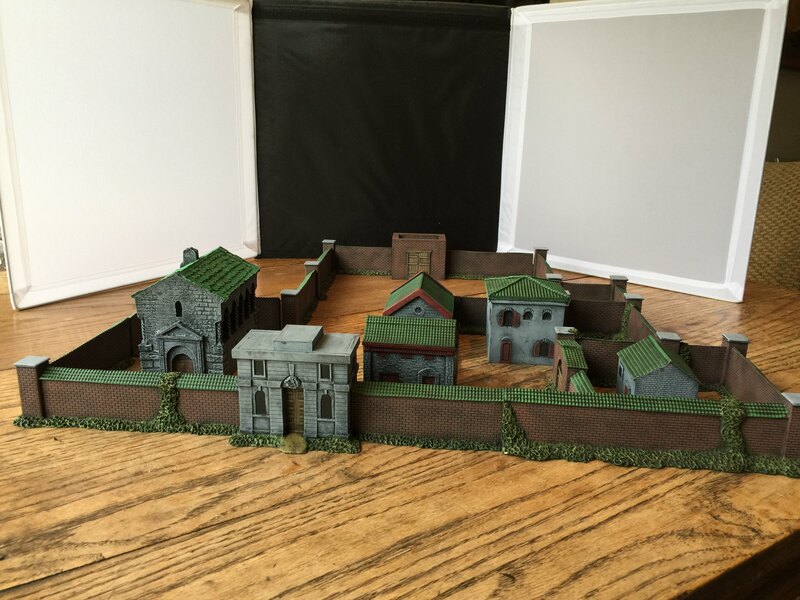 Quite honestly, after 2 months devoted to building the pre-siege version of the five legation walls and associated small buildings I am drained of any interest in further significant scratch building for this project. All in all this will be far from historically perfect, but if it works out as planned I think it will offer a nice feel for the events. As FifteensAway said, Blue Moon has produced a remarkable range of structures for their Boxer Rebellion line, and I hope to make the most of what they have provided. Thanks so much for writing. I really appreciate your interest. Hope I won't disappoint. Richard, one question and one comment. First the comment, on the barricades on your weekly workbench - a lot of the material was silk and the like and from accounts rather colorful. Nothing wrong with what you've done but any reason for not going more colorful. And then the coach, can you recall further details as to its origin? I'd like to add one or more to my Old West set up - at least for my most urban town. And maybe use as a basis for some kit bashing. Wow, absolutely impressive, and inspiring!!! Don't know if I've noted this here or not but the Jordan range of figures may be no more. The man himself passed on and someone stated they thought he'd requested the molds be destroyed after he was gone. Hope not but his right to have it done if he so wished. So, if you see one, want it, can afford it - buy it. You may never see it again. edit: Oh, no! I might upset Richard with this. Sir, are you aware that Presier makes an HO set, 20383, of six dromedary camels? Those would be the two hump variety (double Wednesday? ). I know you have some camels with one hump for your Boxer setup. But the photos I've seen show two humped camels as the beasts of burden - or just roaming about. Just thought you should know this. No, no, this is not a ploy to slow you down so I can catch up, never crossed my mind, besides, you are way too fast for that. Just a thought. What, who, me, evil? Not very often. Dan, thanks so much for taking the time to write and for the generous words. Much appreciated. FifteensAway, not only should the camels be two humps, but brown and furry. But I have the ones I have and my local train shop doesn't have the ones you mention... and they usually have it all, so I'll just live with what I have. That said, it will be several weeks before we take pictures... the rain is slowing the process so maybe. And evil never crossed my mind. Well, perhaps one day I can stand you a drink. And with any luck it will be while waiting to board the Jungle Cruise at Disney! And congrats on the find. I'll have to dig mine out of their closet at some point - at least I know where they are, or should be. Richard, Richard, Richard, "fingers drumming methodically on table", "foot tapping industriously and noise-fully and monotonously". I...we've...been waiting, waiting, waiting. Where is our gallery, sir? And ply me not with my own lack of progress, sirrah. This is about you making us wait, fellah! I am sure Richard will show us his own gallery soon. But, fifteensaway, what about your own progress sir ?